Maria has been hired by the Ghastly Chemicals Junkies (GCJ) company to help them manufacture bullseyes. 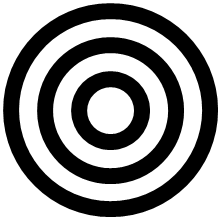 A bullseye consists of a number of concentric rings (rings that are centered at the same point), and it usually represents an archery target. GCJ is interested in manufacturing black-and-white bullseyes. Maria starts with t millilitres of black paint, which she will use to draw rings of thickness 1cm (one centimetre). A ring of thickness 1cm is the space between two concentric circles whose radii differ by 1cm. Maria imagines a white ring of thickness 1cm around the last black ring. Then she draws a new black ring of thickness 1cm around that white ring. Note that each "white ring" is simply the space between two black rings. Maria only draws complete rings. If the remaining paint is not enough to draw a complete black ring, she stops painting immediately. There will always be enough paint to draw at least one black ring. The first line of the input gives the number of test cases, T. T test cases follow. Each test case consists of a line containing two space separated integers: r and t.
1 ≤ r, t ≤ 1000. For each test case, output one line containing "Case #x: y", where x is the case number (starting from 1) and y is the maximum number of black rings that Maria can draw.